Dr. Farias-Eisner is currently the Chief of Gynecology and Gynecologic Oncology in the Department of Obstetrics and Gynecology at UCLA, a Principle Investigator for the National Cancer Institute (NCI) - Gynecologic Oncology Group (GOG) and the Director of the Center for Biomarker Discovery and Research at UCLA that is dedicated to the prevention and early detection of women's cancers. A graduate of UCLA where he earned a B.S. in Biochemistry, he received an M.D. at the Royal College of Surgeons in Ireland. After graduation, he was recruited to the University of Chicago University of Illinois where he obtained training in Emergency Medicine and Critical Care. He was then recruited to UCLA in 1986 to train in Obstetrics and Gynecology, and Gynecologic Oncology, and then was recruited to become a faculty member in the Department of Obstetrics and Gynecology, division of Gynecologic Oncology in 1992. 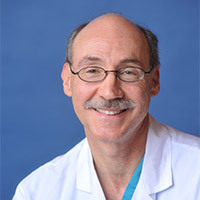 Dr. Farias-Eisner was the first to complete the STAR (Specialty Training in Advanced Research) in the Department of Obstetrics and Gynecology at UCLA, earning a Ph.D. in Molecular Biology in 1999. Dr. Farias-Eisner has received numerous research awards and has earned UCLA's Outstanding Faculty Teaching Award in the Department of Obstetrics and Gynecology in 1993, 1996, 2004, and 2005, and the STAR Program Faculty Award in 1999 and 2000. In 2004, he was presented with the International Spirit of Life Foundation Scientist of the Year Award, and in 2005, the coveted National Association of Professors of Gynecology and Obstetrics (APGO) Outstanding Faculty Teaching Award. Recently, his peer reviewed publications include nearly 40 original articles in journals such as the Proceedings of the National Academy of Science, USA, the Journal of Biological Chemistry, the journal of Cellular Biochemistry, the journal of Gynecologic Oncology, the Journal of Neuroscience, the Journal of Neuroscience Research, and the International Journal of Gynecologic Oncology, to mention a few. Moreover, he has been selected to review articles for these very same prestigious journals. Dr. Farias-Eisner has written numerous book chapters and has been invited for more than 50 presentations, nationally and internationally.